Laura is a member of the personal injury team at Carroll & O’Dea Lawyers. Laura completed her law degree with Honours at the Western Sydney University as well as a Bachelor of Arts majoring in history and political thought. During her university studies, Laura was awarded a scholarship from Western Sydney University to study in Beijing, China for one semester which has given her invaluable experience in working with people from different cultural backgrounds. Laura has also done volunteer work with the Asylum Seekers Centre in Sydney, where her role was to assist refugees and asylum seekers in finding employment opportunities within Australia. 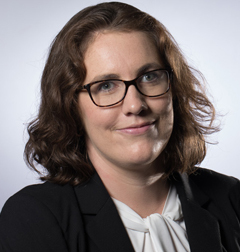 Laura is a plaintiff lawyer who acts for clients in their Workers Compensation, Motor Vehicle Accident, Public Liability and Medical Negligence Claims. Laura was awarded the 2017 Honours Scholarship from Western Sydney University. She completed her Bachelor of Laws (Hons) and Bachelor of Arts (History and Political Thought) at Western Sydney University in 2017. Laura joined Carroll & O’Dea Lawyers in September 2014 as a law clerk. She was admitted as a solicitor to the Supreme Court of New South Wales in October 2017. Robert Algie and Laura Flanagan from Carroll & O'Dea Lawyers Parramatta recently looked after my motor vehicle accident claim. From the outset I felt confident I had chosen the right law firm to represent me. I found both Robert and Laura to be very professional, honest and knowledgeable in all aspects of my case. Their guidance and support was exceptional. They kept me well informed with minimal impact to my day to day life. The success of the claim is a true reflection of Robert Algie's work ethic and dedication to his clients. I would highly recommend you contact Robert and his team at Parramatta for all your Personal injury matters.